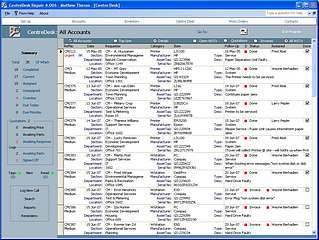 CentreDesk Repair is a FREEWARE multi-user helpdesk repairs application, that is affordable and easy to use. Member of the CentreDesk group of Help Desk applications. Fast, easy call logging, easy call tracking, with the full history of all actions taken. Easily assign logs to technicians. Time tracking, (calculates holidays and working days) and flagged to indicate the current status and duration. ...... parts are automatically set to "On Hold"
* Security ensures that only logs assigned to individual technicians can be viewed by them. * Provides a flexible workflow. * Invoicing (including a cancellation fee option) and a Batch Email facility. * Your SLA Contract labour charges are automated for quotations and invoices, so you don't need to remember the different rates for each client and category. Qweas is providing links to HelpDesk CentreDesk Repair 5.401 as a courtesy, and makes no representations regarding HelpDesk CentreDesk Repair or any other applications or any information related thereto. Any questions, complaints or claims regarding this application HelpDesk CentreDesk Repair 5.401 must be directed to the appropriate software vendor. You may click the publisher link of HelpDesk CentreDesk Repair on the top of this page to get more details about the vendor.